Are you fed up of switching between online radio stations to listen different kinds of music? If yes, now you don’t need to switch. You can listen to all the music on one website for free. Here below is the list of 7 best Websites. 1. 1.FM Here you can find 39 different radio stations among which Absolute Reggae Trade, Absolute TOP 40 Radio, America’s Best Ballads , Classic Rock Replay and Club 1 Radio are the 5 featured stations. You can even view current playing tracks on these different stations, latest news, latest videos and upcoming events. You can join the forum. You can listen to your tracks on your 3G phone also. 2. 181.FM This websites gave you 80 different radio stations in 13 genres(New Channels, Oldies, 80’s Decade, 90’s Decade,Pop, Rock Channels, Country, Urban, Dance/Techno, Easy listening, Latin/Tropical, Talk Radio and Christmas). You can search by genre or artist name. There is a public alive chat room where you can chat with others without any registration. 3. 1CLUB.FM There are 80 high quality different channels in 12 kinds of stations(Top 40/Pop, r&b/hip-hop, rock, dance/edm, dance (old school), decades (70’s – 90’s), blues/jazz, country/americana, oldies (20’s – 60’s), latin/world/raggae, classical/relaxing and news/talk/info). 4. AccuRadio AccuRadio says that it has hundreds of music channels over 60 genres. You can personalize these channels. You can either skip a song or mix different genres into a single channel or even delete an artist from playlists. 5. 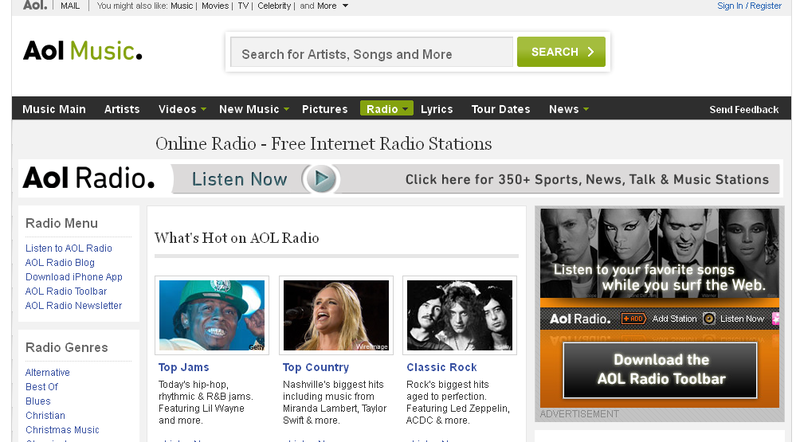 AOL Radio It has hundreds of music channels over different genres. You can add any channels to your preset list without registration. You can view Top 10, Top 100 songs and even greatest hits of the year. 6. Live 365 This is an internet radio network which offers 23 number of different music genres. You can install a Live365 application for your iPhone, BlackBerry or Windows mobile. 7. OnlineRadioStations This offers 32 radio channels. Here you find lists of featured stations. After successful registration you can create your own playlists. You can sort channels by genres, countries or regions. Just visit any of these site, tune into your favorite radio channel, listen to your favorite music, and enjoy!!!!!! !